ig Suit Energy. It’s a thing. 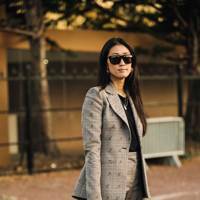 Yes, Bianca Jagger and Diane Keaton (circa Annie Hall) have long had a penchant for oversized, structured tailoring, but there’s a new guard of powerful females putting their own stamp on suiting. Rihanna, Bella Hadid and Victoria Beckhamare often papped wearing bold two-pieces for hotel-to-car paparazzi appearances (the most valuable street-style real estate). But in the past two weeks, there have been three stars who have demonstrated exceptional BSE. Not just for the confidence that radiates from the very seams of their suits, but the messages behind the branding. Herewith are Vogue‘s current BSE icons. 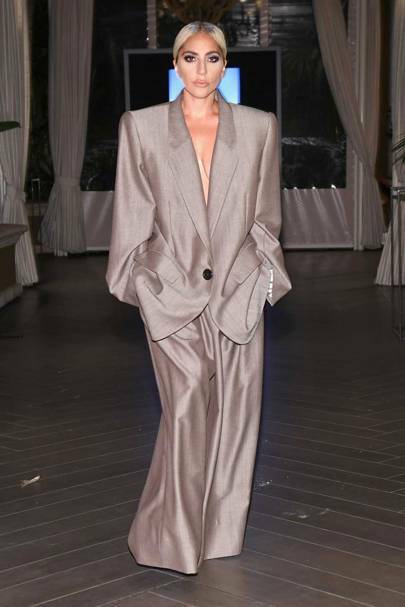 The conceptual pop star-turned-actress took to the stage at a Women in Hollywood event in a grey Marc Jacobs suit that seemed to envelope her whole being. For a woman who spent the past weeks in fantastical McQueen, Givenchy and Valentino couture on the promo tour for A Star is Born, it was resolutely stripped back and came from a place of contemplation and resistance against the standards that Hollywood imposes. “We are not members of a giant beauty pageant meant to be pitted against one another for the pleasure of the public… we are voices,” she stated. “As a sexual assault survivor by someone in the entertainment industry, as a woman who is still not brave enough to say his name, as a woman who lives with chronic pain, as a woman who was conditioned at a very young age to listen to what men told me to do, I decided today I wanted to take the power back. Today I wear the pants.” It took one film for the industry to accept Gaga as an actress, and one film for her to use her platform to speak out on Hollywood’s stage – a stark comparison to the industry itself, which is taking aeons to shift. May this BSE continue as Gaga strides closer towards awards season 2019. Charged with hosting the American Music Awards for a second year, Ellis Ross used her time on stage to spotlight the brilliant black designers working in fashion. Her first look? A sugary-pink Pyer Moss suit with black lapel and trouser accents. Founded in 2013 by Kerby Jean-Raymond, the brand calls itself an “art project” or “a timely social experiment” designed to challenge society and promote conversation through collaborations with other artists. 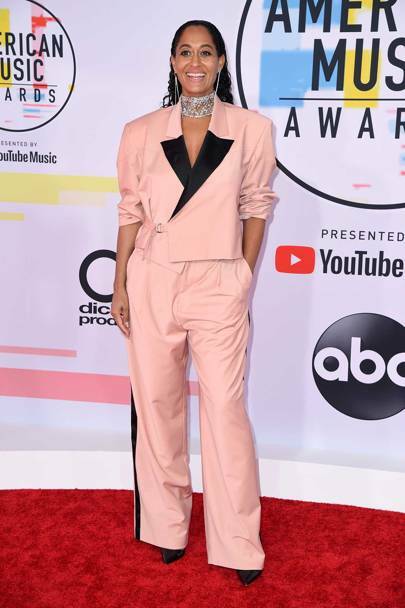 So, with a little help from Jean-Raymond’s killer shoulder pads, Ellis Ross managed to set the tone for the whole evening. “Dial up [the] compassion, dial down [the] judgement,” she told the audience. And they sat up and listened. Lewis attended the same Women in Hollywood event as Gaga, but trod down the louche suiting path by way of Haider Ackermann’s silk pyjamas. The opulent copper tone of the separates was a theme of the entire autumn/winter 2018 collection as the French designer embraced a meditative mood. “I wanted to have this fragility but at the same time show happiness through the colours. The girls were raised up,” he told Vogue after the show. “We’re going through strange times.” If assurance can be found in spicy orange silks, then no wonder Lewis, who looked understatedly cool (as per), chose Ackermann to stand alongside her peers at an evening focused on raising up women.